Telecom tower power systems are used to provide power backup in case of power interruptions. Diesel gensets, lead acid batteries and solar power systems are the most common types of power equipment deployed in telecom towers. Increasing number of mobile subscribers in India and adoption of advance network technologies such as 3G and 4G are the major factors for the growth of new telecom towers by 2023. Replacement of power systems would further enhance the India telecom tower power systems market forecast revenues over the coming years. According to 6Wresearch, India telecom tower power systems market size is projected to grow at a CAGR of 4.1% during 2017-23. Improvement in electricity supply rate in India especially in rural areas and increasing environmental concerns due to excess usage of diesel gensets in telecom towers is encouraging telecom companies to cut carbon footprints and switch to more environment friendly power solutions such as batteries and solar power systems. Tier 2 and tier 3 cities would experience highest India telecom tower power systems market share due to growing subscriber base and increasing internet penetration. Power systems installed in unreliable grid sites accounts for maximum revenue share followed by reliable grid sites due to improvement in power supply position. Advance technology such as lithium ion batteries would also witness growth in coming years. The India telecom tower power systems market report thoroughly covers the India telecom tower power systems market by types, by grid type and by regions. The India telecom tower power systems market outlook report provides an unbiased and detailed analysis of the on-going India telecom tower power systems market trends, opportunities high growth areas, market drivers which would help the stakeholders to device and align their market strategies according to the current and future market dynamics. • Historical Data of India Telecom Tower Power Systems Market Revenues and Volume for the Period 2014-2016.
of Revenues and Volume until 2023. • Market Size & Forecast of India Telecom Tower Battery Power System Market Revenues and Volume until 2023. 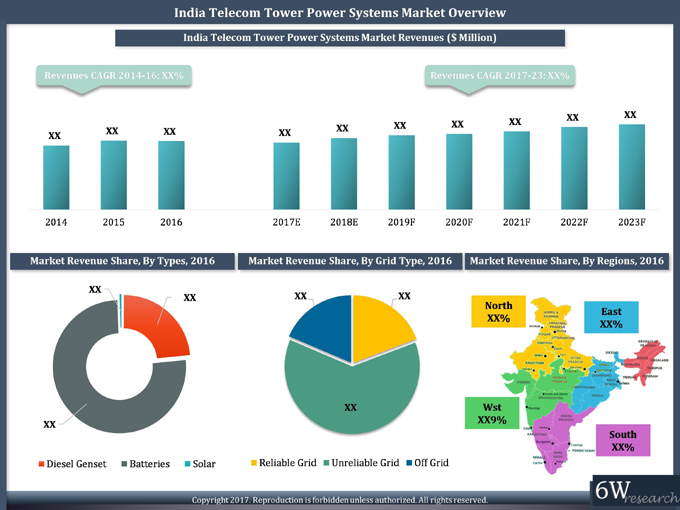 • Market Size & Forecast of India Telecom Tower Power System Market Revenues for Solar Type until 2023. • Historical data of India Telecom Tower Power Systems Market Revenues for Solar Regional Market during 2012-2016. 13.4. Kirloskar Oil Engines Ltd.
13.5. Mahindra & Mahindra Ltd.